Daniel Loh: Coming back from holiday makes me learn something about the stock market!! Coming back from holiday makes me learn something about the stock market!! It has not been a good start to year 2016! In fact, a lot of analysts, traders and chartists think that we are already in a bear market. Investment experts like George Soros or Hu Li Yang or Marc Faber (Dr. Doom) seems to think we are already in a bear market did not help matters! Investors certainly started to have more doubts following what they said! And that is the reason why I decided to have a break off trading in the month of February! And that is also the reason I have not blogged since the start of the year! I am just not sure about the direction of the market. Yea, I decided to have some fun in a Korea trip! Of course, today I am not trying to talk to you about how good the trip is, but what I learnt about skiing and the stock market! Yeah, I even think about stock market in the trip! In every ski resorts, just like the one I went, there are different ski slopes for different categories of people. 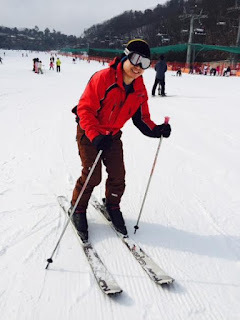 There is the beginner slope, the intermediate and the advanced slope. It goes without saying that the beginner slope is the most gentle. And that is where I spent my whole day. Practising on the almost flat gentle slope. This is what I realised, I simply can't fall down! If there is no slope, a beginner like me don't have to worry about falling, as we travel so slowly on the ground that we are hardly moving! Stock market is just the ski slope. If world economy is so slow and having little growth now, there shouldn't be a long lasting bear market, should there? Even if we are already in a bear market like what a lot of investors thought, don't worry! Because this landing won't be as hard too! When you are not skiing fast down the slope, even if you fall, you won't hurt much! You will suffer a hard landing ONLY if you attempt to ski down a STEEP slope at high speed. And that is the reason after my skiing trip, I found a new confidence in the market again! 1) US economy is still showing strength and not weakness. Just look at the unemployment rate. Why do we worry when US economy is showing progress? Warren Buffett is still not screaming STOP! 2) The world economy like Japan and Europe is still recovering but not in hyper growth mode. There is no hyper inflation, hence I think US interest rate won't rise as fast, which is good for the stock market. 3) China is still at the bottom of the slope, its GDP is still sliding down gently. It probably won't suffer a hard landing like what George Soros suggest, but a gentle landing. In fact, I think rather, it is bottoming as it almost reached the end of the slope already. Shouldn't you buy China assets now rather than shun them?? 4) I know that some says STI and Hang Seng has dropped more than 30% from the peak. Dropping 20% is considered by some as entering a bear market. And if you think so too, don't worry. History have shown that there are some 20% drop bear markets that are shallow too! Bear Markets can be as short as half a year to 1 year! The deciding factor is whether we are in a hyper inflated state! Currently I don't think so. That is the reason why FED interest rate don't have to drive up fast to stop inflation. Without inflation, this bear market if it happens, will be very short too! It will not be a Lehman Brothers collapse! Don't worry, the banks got their lesson the last round. Certainly not Singapore as Government already have strict bank and mortage controls. And that is why after this trip, I am loading up on my AMMO GRADUALLY again in search for oversold stocks!!! Stocks like Alibaba, Apple and Semb Marine or oil companies are certainly on my shopping list! Take out your guns too!!! This is too good a chance to be missssed! Maybe gradually load up, not all at one shot. And for my blogging friends, I will post more again as I think market is cheap again..